I am now 10 days into my new grocery shopping habits. In 10 days our family has spent $175 which puts us on track for a $525/bill for the month. I did very good in week one, doing only one shop and this has done the majority of our groceries for the entire week and a half. This week though has been a busy one and I've found myself running out of a few items and having to make a few extra trips. This no doubtedly would have been solved had I made the Sunday shopping trip at the beginning of the week. Meal planning has really helped me get better use of my groceries and reducing waste. I used to be very good at managing our food budget, but it has increasingly become a larger and larger expense each month. A recent analysis of our expenses showed that for a family of 3 we're spending close to $900 a month on groceries. This includes our 2 year old son, who at this point, really just eats scraps. I've set a new budget of $500/month initially and would like to get it down to $400. I plan on doing this by setting a weekly menu and do one big shop. Our busy lifestyle has left us with last minute meal ideas and many trips throughout the week to the grocery store. Without a plan, we often would pick up convenience foods, or buy a few items on our way home without a real plan. The result is a higher cost for prepared foods which are undoubtedly higher in sodium and less healthy and a lot of wastage food. We'd buy items on a whim without any plan for them only to find them waste away in our fridge. We once thought that picking up a few items each night for dinner would help reduce our bill but it's had the opposite effect. We often pick up extras adding to a higher bill and it doesn't address existing leftovers in our fridge. So what I'm hoping to do is set a weekly menu which will list out all ingredients for the entire week. This means that if I have a stirfry on Monday which has broccoli, I'll plan later in the week to have another meal with broccoli so I don't let half a head of broccoli go to waste. This will help me know exactly what i'm spending on each week and also eat a better diet. Also, once I have a spreadsheet of prices, I'll be able to better budget as I'll know exactly what items are costing me. Wish me luck! It's been over 2 years since I've made a post but I'm finally reviving this blog. Much has changed over the past couple of years and I've been kept very busy with our 2 year old. Over the past two years our family has been not so frugal, focusing mainly on convenience for our changing lifestyle. My husband and I are expecting our second child in January at which point will be looking to upgrade our house. I'll be on maternity leave leaving my husband to cover most of the bills, so I'm looking for ways to reduce our monthly costs and return to the life of frugality. Waiting for T3 slips to file your tax return? By now, many Canadians will have received a number of T4 and T5 slips and are just about ready to file your tax return. If you hold mutual funds, some ETFs or trust units however it could be well over another month before you receive your T3 slips. While T4 and T5 slips must be issued by the end of February, T3 slips do not have to be issued until 90 days after their year end, leaving most slips being issued around March 31st. Last year many of these slips did not often arrive in people's mailboxes until mid April. This is often a hassle if you want to file your return early, especially if you're expecting a large refund in the current year. There is a solution to enable you to file early without receiving your T3 slips. Trusts and fund companies are required to report the tax information on these units by Feb 28 2008. This information will be publicly available on CDS Innovations Inc.'s website. Currently information is posted up to the 2006 year. 2007 numbers will appear shortly. Here's how to access this info: From the main welcome page, click on the Tax Breakdown Posting link, select your language preference and then choose the type of slip you are waiting for - T3/T5013 or if there is a late T5 you're still waiting on these will also be available. The slips are filed by security name and there is an excel spreadsheet available for download which shows each month's distributions on a per unit basis. As an example, let's say during 2006 you held Pengrowth Energy Trust units for the entire year in 2006. The month of January shows that a distribution of $0.25/unit was paid out to unitholders, of which $0.23750 is taxed as interest income and the remaining $0.01250 is taxed as return of capital which reduces your adjusted cost base. Based on this information you can then take your distributions that you received and allocate the total distributions to 95% other income and 5% as return of capital and report this as if you received your T3. It will take a little bit more effort on your part and if you hold a large number of funds, this could be a time consuming process. However, this can be very helpful if you're willing to spend the extra time and effort. It's that time of year again when many Canadians are starting to buy personal tax software packages. It can be confusing for many people and each year the number of software providers is increasing. I personally find the most popular tax program QuickTax to be the most expensive and most confusing. This year they've come out with about 4 different versions. For most Canadians, they are buying a software package to make the tax filing process easier. QuickTax however, starts off by making the process more complicated than needed. They offer many different versions raning from a Basic to Business Version leaving the taxpayer with questions about which product is best for them. When I first looked at the options this year, I thought I may have mistakenly ended up at the Windows Vista page. Given the wide array of products out there for Canadians, I recommend looking around at other alternatives. Many of the new programs allow you to download the program and try it out before purchasing. My top picks for the 2007 tax year are StudioTax for Windows and TaxFreeway for the Mac. Here's a chart to help you wade through your options. Up until 2007 there have been very few options for Mac users wanting to file their tax returns electronically. Users could use web-based programs such as U-file and QuickTabWeb but there haven't been many downloadable options. I switched to a Mac late in 2007 and was wondering what I would do during tax time. I happily made the switch to a Mac and have had no need for Windows programs up until now. For the past few years I have used the Windows version of TaxFreeway which I have been quite happy with. Much to my surprise they have come out with a version for the Mac! While the windows version is $9.95 for up to 20 netfiled returns, the Mac version is $14.95(for a limited time before it increasing to $19,95). While I'm unhappy about the higher price, I test-drove the Mac version on the weekend and once again it meets my needs. I was happy to see that I could carryfoward information from my 2006 Windows version into the Mac version so I did not have to re-enter all this information. For most people, I think TaxFreeway is an excellent choice. While it may not have as many bells and whistles as QuickTax, it definitely gets the job done at a very affordable price. 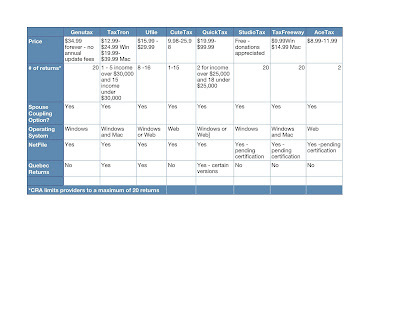 Another program available for Macs is TaxTron. It is a little pricier especially if you have a need for multiple returns. The price range from $19.99 - $39.99. You can also download a version for free to try it out. For a complete list of your tax filing options, see Canada Revenue Agency's site. While many tax providers are already claiming that are Netfile certified for 2007, CRA doesn't officially certify providers until the end of January.